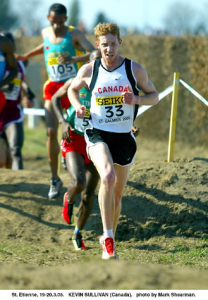 Kevin Sullivan’s international career stretched across two decades as he was one of very few athletes to excel as a junior and then continue to make enormous improvements into the professional ranks. “Sully”, as his teammates at the University of Michigan nicknamed him, claimed the bronze medal at the 1992 IAAF World Junior Championships in Seoul and then went on to astonishing 5th place finishes at both the 1995 IAAF World Championships in Goteborg and the 2000 Sydney Olympics. The latter result was perhaps his most defining as he was in arguably one of the most competitive Olympic 1,500m finals in history. In addition, he represented Canada at three Commonwealth Games with the highlight being a 1,500m silver medal 1,500m in Victoria at the 1994 games.